Painter in a "Home of Madness"
The first impression one had when entering Amer Fatuhi’s second one-man show (Al-Riwaq Art Gallery, October 21-28) was sheer surprise. First of all in the twenty paintings there were no shenashils, no arches, no domes and no Baghdadi cafes, sougs or bazaars. The figures that appear in the paintings are unfamiliar and extremely out of place. Man, as far as Amer is concerned, lives in constant conflict with the whole world around him. And it is this struggle that gives man his identity. Thus, all figures that appear in the artists paintings lack emotion and seem unsure. Those figures reflect a certain feeling that obsesses the artist’s mind in search for genuine and everlasting friendship. Amer Fatuhi a scholar who has developed an extraordinary capability to paint and produce more and more "exceptional works" until he had the opportunity to hold his first one-man show, under the title "Hard Times", in 1981. Two main themes prevail in Amer’s current exhibition. 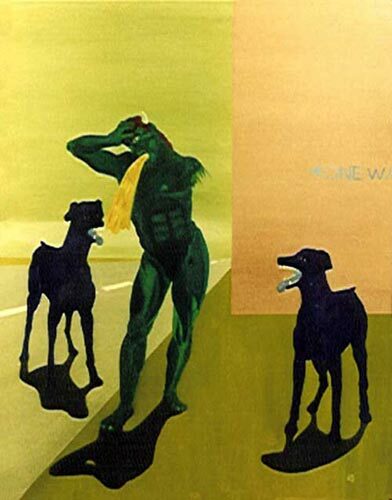 The first is reflected through a collection of works in which the artist has employed a realistic style. 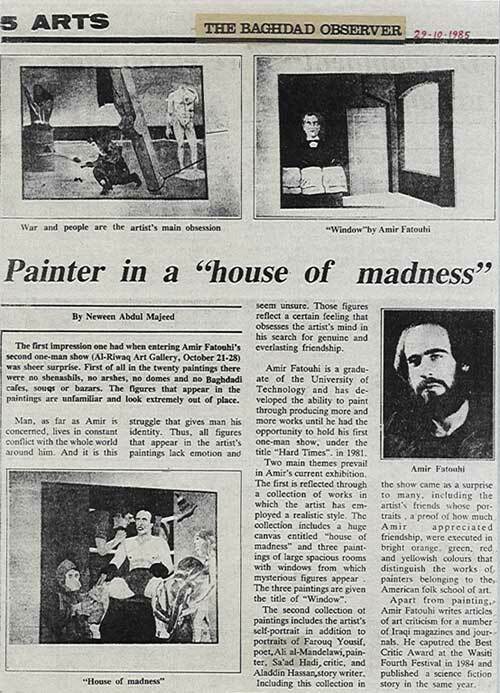 The collection included a huge canvas entitled "home of madness" and the three paintings of large spacious rooms with windows from which mysterious figures appear. The three paintings are given the title of "Window". The second collection of paintings includes the artist’s self-portrait in addition to portraits of Farouq Yousif, poet, Ali al-Mandelawi, painter, Sa’ad Hadi, critic, and Aladdin Muhssin, Photographer Artist, novelist and writer. Including this collection in the show came as a surprise to many, including the artists friends whose portraits, a proof of how much Amer appreciated friendship, were executed in bright orange, green, red, and yellowish colors that distinguish the works of painters belonging to the American Pop-art school. Apart from paintings, Amer Fatuhi writes articles of art criticism for a number of Iraqi magazines and journals. He captured the Best Critic Award at the Wasiti Fourth Festival in 1984 "For the oil on canvas art work titled -East" and published a science fiction novel in the same year.